Florida Sandhill Cranes are long-legged, long-necked, gray, heron-like birds with a patch of bald, red skin on top of their heads. Cranes feeding on my neighbor's lawn. 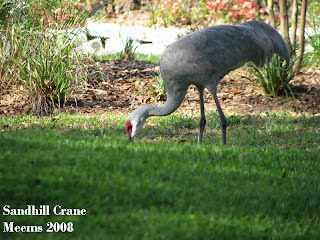 Even though we see them year round in central Florida the Sandhill Crane population is noticeably increased of late. It is true some Sandhill Cranes live here all year long but there are also those that migrate here during the winter. It's fascinating to watch them stroll about foraging both on land and in shallow wetlands. I caught sight of this pair (only one is shown in the photo) when at my mailbox. They are poking their heads into the ground of my neighbor's yard looking for food. Some of their favorite meal items include seeds, plant tubers, grains, berries, insects, earthworms, mice, snakes, lizards, frogs and crayfish. Unlike other wading birds, such as herons, Sandhill Cranes do not "fish." They typically skulk about in pairs. Pairs mate for several years and even sometimes for life. A couple of years ago we had an almost daily visiting pair to our neighborhood and then one day there were four. Only the additional two were much shorter and had fuzzy little bodies. They were adorable. Now I wish I had been into photographing everything that moves back then... oh well. Young Sandhills stay with their parents until they are about 10 months old. I thrill at seeing the cranes fly overhead with necks outstretched in a most powerful, rhythmical form. 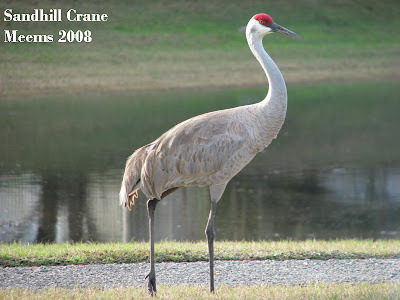 And the voice of the sandhill crane is one of the most distinctive bird sounds in Florida. I can't help myself but to stop and watch whenever I hear them coming. On my way to an appointment not too far from my house a couple of weeks ago I took this photo next to a suburban pond. This morning passing by the same pond there were 6 Sandhills then there were 4 more around the bend. Of course I didn't have my camera (shame on me) but this guy and its mate were probably among the group. 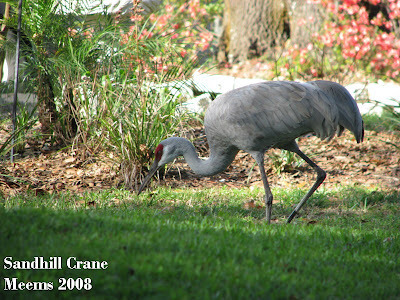 Sandhill Cranes are primarily birds of open freshwater wetlands, shallow marshes, wet meadows, and adjacent uplands. They utilize a broad range of habitat types, from bogs, sedge meadows, and fens to open grasslands, stubble fields, and savannahs. I guess that explains why I have been seeing them everywhere I go these days. Does anyone else like them as much as I do? Or is it just me? These are adorable creatures - I always thought they were an endangered species. They have an endearing, gangly quality to them. I love your header photograph. The flower is gorgeous. What amazing creatures! Thanks for sharing. Your garden is lovely and colorful to eyes that have only been seeing WHITE! But the snow is melting now, and spring will be here soon, Yippee! Your azaleas are gorgeous! We were so amazed to see them blooming when we were there. Hopefully, it won't be long till we see them up here, as well. Blogger is having a nervous breakdown, I think; your header photo has gone missing and so have several of the photos in this post. But I enjoyed what I could see, as always, and I learned about birds I'd never seen before. Do they happen to eat the dreaded fire ants that I hear so much about? Kate: Thank you for the kind comments- I'm glad you like the header. The cranes did used to be endangered here and as far as I've been able to find out they have recovered but they are still endangered in Mississippi and maybe elsewhere. Connie: Your snow is an amazing sight to see too and the melting snow must be really good for the earth where you are. You are right- spring is surely on its way and I can't wait to see your "colors" when it warms up... I know they will be gorgeous. Sophie: I know what you mean about trying to fit everything into 2 days- AND the travel time! I do hope you can come for longer and be sure to plan it before it gets miserably hot. Your azaleas should follow right behind ours and -then just think -you guys have those gorgeous dogwoods to bloom in a couple of months that refuse to blossom for us down here. That's when I have to make a trip up there just to take in the beauty of them (well, and I get to see my son:-). Hi Jodi: Blogger can be good and blogger can be really naughty sometimes... looks like it recovered as all graphics and copy are back in place. maybe someone else knows and can help us out???? Well, I know my MIL likes them as much as you do...maybe even more! Can you imagine, a child leaving its parents at 10 months? Wow. Independent little things, huh? I saw two of those beautiful creatures right in front of my friend's house. What a wonderful sight to behold. I also attended an Audoban society meeting on Florida birds of prey that was amazing. They had a caracara, bald eagle and screeching owl that they'd rescued. 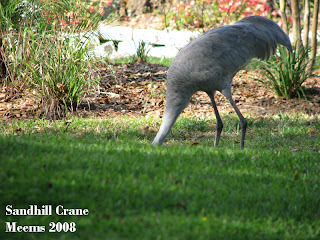 carolyn: yes, cranes are quite adapted to the suburbs around here. The audubon birds of prey meeting sounds great... great birds you got to see too. rusty: I imagine they love the Everglades... so much land and water! I always get excited when I see a pair of cranes. Whenever I drive north to Lake County, I never fail to see them in several places along the way. A sighting is always a treat. There has been a pair at my daughter's school the last two days. I definitely think they are on the rise. Susan: They are beautiful creatures and so adapted to human kind as long as we keep just a little distance and respect their space.